In what amounts to a massive split among academicians at Delhi University and across the Capital, clear lines of action and reaction are emerging between the conservative protestors and liberal democrat supporters on A.K. Ramanujan’s book, ‘Many Ramayanas’, which provides varied versions of the Ramayana epic and its central characters. The Delhi Society for Promotion of Rational Use of Drugs organised a two-day workshop for nurses. The workshop, jointly organised with the Directorate of Health Services at the Ahilya Bai College of Nursing, was inaugurated by president of the Indian Nursing Council T Dileep Kumar. An elderly man was mowed down on Thursday by a speeding Blueline bus after being hit from behind in south Delhi, the police said. The accident occurred in the morning when the bus plying on Route No 463 hit the bicycle rider, who was yet to be identified, near the Asian Market in Mehrauli area. A 33-year-old man, Manoj, resident of Lal Quarters in the Punjabi Bagh area was shot dead by some assailants last night at Shakoorpur railway station. The incident took place on platform number 1 where Manoj was shot twice in the chest and stomach. He succumbed to his injuries on the shot. Model displays the creation of designers Ashish,Viral and Vikrant during a press preview of WLIFW Autumn-winter '08-09 in the Capital on Thursday. Two unidentified men threw acid on a schoolteacher, who has been admitted to a hospital with severe burn injuries, a senior police official said on Thursday. High capacity bus corridors that promise to put the Indian Capital’s public transport system in league with world-class cities like Beijing and Taipei will be thrown open to the public in June this year. The Associated Chamber of Commerce and Industry of India (ASSOCHAM) has suggested installation of closed circuit cameras on all accident-prone roads so that the violators are caught and accidents prevented. The Delhi Traffic Police has launched a special drive to nab the drunken and rash drivers in the late hours of the night. The Delhi High Court on Thursday slapped a fine of Rs 50,000 on the Capital’s police force for illegally detaining a person last year. The court also asked the Delhi Police commissioner to hold an inquiry against the officials responsible for the illegal detention. Ansal Institute of Technology (AIT), Gurgaon, is organizing a Workshop on Mastering the Art and Science of Teaching Engineering and Research (Master) jointly with Hewlett-Packard University Relations, on March 3-4 on its campus. The Faridabad Industry Association(FIA) and Bangladesh Engineering Association today signed a memorandum of understanding (MoU) for mutual cooperation inAutomobile sector. Doctors of the department of Neurosurgery at Sri Ganga Ram Hospital have removed a large -sized brain tumor (meningioma) from a middle-aged woman. The National AIDS Control Organisation (NACO) and the Nehru Yuva Kendra Sangathan (NYKS) jointly organised a Red Ribbon Express exhibition of photographs and a signature campaign to highlight the menace of AIDS in the Central Park, Connaught Place here yesterday. A street play “Bimar Bhi Insaan Hai” was also staged on the occasion. The Delhi government has declared that it is trying its best to ensure proper planning and timely preparation for the 2010 Commonwealth Games. Delhi Chief Minister Sheila Dikshit today exhorted the scientists and cardiologists from all over the country and abroad to discuss the recent advances in the field of cardiovascular sciences to overcome threat of heart-related diseases. National Hydroelectric Power Corporation Limited (NHPC), has been conferred with the Amity Award for Best Practices of Corporate Social Responsibility by Amity International Business School. The Humayun Road connecting Shahjahan Road with Subrahmanium Bharti Marg will become one-way from February 29 to facilitate construction of the Khan Market Metro Station. In what amounts to a massive split among academicians at Delhi University and across the Capital, clear lines of action and reaction are emerging between the conservative protestors and liberal democrat supporters on A.K. Ramanujan’s book, ‘Many Ramayanas’, which provides varied versions of the Ramayana epic and its central characters. The dangerous new development is that the academic split is spilling from the university into politics with the BJP taking a clear position on it today. The protestors presented a memorandum to Arjun Singh, the HRD minister and he evidently gave them a good hearing. Madan Sharma from the Shiksha Sanskriti Uthan Nivas informs that, “the support we received from the BJP has been very encouraging, Murli Manohar Joshi came as did the MP, Dr Vijay Kumar Malhotra”. Meanwhile, a solid band of ABVP protestors continue to sit on an indefinite hunger strike outside the VC’s office. Around 300 ABVP supporters collected to protest on the book even as an academic council meeting was running at DU. Evidently, a band of academics who are calling themselves national democrats are demanding the withdrawal of the book from the second year course. Agitated history department students and liberal democrat supporters also gathered at different spots to discuss and observe the situation. Earlier this week, the ABVP protestors had ransacked the history department and the head of department’s office. Liberal democrat students and teachers had sat on a massive protest against the ABVP’s action and got wide support from across academic circles. According to sections supporting the book, A.K. Ramanujan’s work is based on a lifelong research for which he received a Padmashree and cannot be taken lightly. The liberal democrats feel that the book and particularly the offensive article should be viewed as a piece of research on which offense cannot be taken. The vice-chancellor had come out in support of the liberals and three ABVP students were arrested, court procedures begun. However, power lines in academia are drawn with today’s protest, the fate of Ramanujan’s work remains to be decided. Speaking on the occasion, president of the Delhi Society for Promotion of Rational Use of Drugs (DSPRUD) R Parameswar said that though the training courses on rational use of medicines had been held for doctors and pharmacists in the past in Delhi, this was the first ever workshop, on the subject, held for nurses. The workshops is in recognition of the fact that nurses play on important role in health care and can contribute significantly in reducing mortality, morbidity and disability and improving maternal and child health care. He said based on the experience of this workshop, similar workshops would be organised in the future. The two-day course, according to the executive vice-president of DSPRUD Usha Gupta, covered a variety of subjects relevant to the profession of nursing such as ‘Problem of irrational use of drugs’, ‘Adverse drug reactions’, ‘Medication errors’. Dileep Kumar lauded efforts of DSPRUD and the Delhi government for organizing a training programme of this nature. He said nurses perform a variety of functions but their core function is related to the administration of medicines to patients and, hence, the relevance of the workshop on rational use of medicines cannot be overstressed. No corresponding statistics were available for India. It was of the outmost importance that nurses should have proper in-service training on correct use of medicines so as to minimise if not eliminate medication errors. He said apart from holding training programmes for nurses, the time had come to include rational use of medicines in the curriculum of undergraduate and graduate courses for nursing. An elderly man was mowed down on Thursday by a speeding Blueline bus after being hit from behind in south Delhi, the police said. The accident occurred in the morning when the bus plying on Route No 463 hit the bicycle rider, who was yet to be identified, near the Asian Market in Mehrauli area. The bus driver managed to flee from the spot, while the victim, who appeared to be in his 50s, was taken to a hospital, where doctors declared him brought dead. The police said bus was impounded and a search for the driver was on. “We have registered a case and investigations are underway,” said a police official. The ‘killer’ Blueline buses have already claimed more than 15 lives this year. At least 120 people were killed last year in accidents involving the private buses. According to the deceased family members, police called them around 3 am and told about the incident before they rushed to the spot. Punjabi Bagh police and Saraswati Vihar police station personnel argued for quite some time on the jurisdiction of the incident spot. Ashok Nagar ACP also reached the spot but the problem could not be sorted out. Finally when the Additional DCP reached the spot, the body was sent to the Jahangirpuri Hospital. Ghanshyam Das, resident of Raghubir Nagar and a relative of Manoj, said that the deceased worked in a factory in Patel Nagar. He could not throw light on the motive behind the killing. Police has lodged a case and taken up the investigation. In another incident, Mahesh Chand, 42, an AC repair mechanic was stabbed to death on the road in Nand Nagari area. According to police, the incident took place around 11 pm when Mahesh was rushed to the hospital. However, he was declared brought dead. Mahesh Chand was resident of Amar Colony in Gokulpur. Police has taken up the investigation. The incident occurred on Wednesday when Asha Sanhotra, a resident of Ashok Vihar in northwest Delhi, alighted from her school bus at around 3.30 p.m. and headed towards her house. “Two assailants approached her on the way to her house in the DDA flats and poured acid on her,” the official told IANS. Sanhotra, 53, is the school superintendent of the DAV Hansraj Model School, in west Delhi. She received burn injuries on her chest, face and abdomen. “She was immediately rushed to a hospital in Punjabi Bagh. Her eyes have been affected in the attack and the extent of damage could be ascertained once her bandages are removed,” the official added. The police have ruled out eve teasing or robbery as motive. “Preliminary investigations are indicating personal vendetta against her,” the official said. Also called bus rapid transit (BRT) corridor, the first such pathway on the 14.5-km long Ambedkar Nagar-Delhi Gate stretch will be made operational by June 2008. The corridor is a set of roads elevated to form a pathway for high capacity bus systems. With BRT, the city will join cities like Beijing, Mexico City, Sao Paulo, Bogotá, Taipei, Hanoi, and Lima, to name a few, where the system has already been adopted to address problems of congestion and pollution. “BRT will bring a sea change in the city’s public transport not only in terms of comfort but also in efficiency,” Delhi transport minister Haroon Yusuf told IANS. “Around 85 low floor buses, currently plying on different routes, are already a hit with the people. They will certainly like them when they start plying on the dedicated corridors,” Yusuf said. The BRT corridor will have dedicated lanes for low floor buses, cars, bikes and other buses to boot. Each low floor bus has a seating capacity of 35 passengers, while the capacity for standing would be 45. “Around 45 low floor, compressed natural gas (CNG) buses will run on the (Ambedkar Nagar-Delhi Gate) route initially. The number would be increased later,” the transport minister said. The project worth Rs.18.19 billion will be a milestone for the infrastructure upgradation being carried out in Delhi for the Commonwealth Games in 2010. “We would work out a proactive action plan for the other routes after the operationalisation of the Ambedkar Nagar-Delhi Gate corridor. We hope to commission the other routes before 2010,” Yusuf said. But the corridor project has been in the thick of controversy for adversely affecting the flow of traffic. The Ambedkar Nagar-Delhi Gate corridor has also claimed many lives since last year, prompting people to express concern over its safety. Delhi’s chief secretary Rakesh Mehta said four fatalities had taken place on the stretch since 2007 when the BRT construction started. In 2006, 15 fatalities were reported from the stretch, while there were 32 in 2003 and 10 in 2001. But, despite the hazards during construction, the official said the corridor had much to boast about. The Chamber also suggested stringent punishment to those who violate speed norms. In a communication sent to the Delhi chief Minister and the Lt. Governor, ASSOCHAM secretary general, D S Rawat also said that time had now come when vehicles plying on Delhi roads ought to have speed governors installed in them, otherwise, the frequency of current road accidents would continue. The tremendous increase in the number of motor vehicles has created a major problem—of loss of valuable lives in road accidents with drunkenness being among the major cause for them. ASSOCHAM has also pointed out that the legal penalty under section 185 of the Motor Vehicle Act should be increased from imprisonment of six months to one year with or without fine up to Rs 2000 to Rs 4000 for the first offence. For the second and subsequent offence - if committed within three years of the commission of a previous one, the imprisonment should be at least between two years and five years or fine up to Rs 3000 to Rs 5,000 or more. The Chamber is of the view that with speed governors in place in the public transportation system, the speed levels will remain regulated and this would result in the reduction of accidents. An ASSOCHAM release claimed that the National Capital Territory of Delhi had seen a rapid growth in vehicles in conjunction with the increase in population and urban mobilisation, which has resulted in high traffic volumes. This in turn has contributed to the increase in the number of road accidents. It has also claimed that the poor condition of roads and the multiplicity of traffic on the congested roads has also contributed to the increase in the number of accidents. According to Muktesh Chandra, additional commissioner of police, Traffic, the drive has been launched with the motive to bring down the number of accident cases at night. The drive was launched in the area of South and West Delhi last night in which drivers driving rashly, overspeeding, drunken driving and use of red lights over the vehicles were checked by the traffic police and challans issued to the offenders. Today, the police will take the drive to North and North-West part of the Capital. According to police survey, a majority of accidents during night take place on Rohtak Road, Najafgarh Road, GT Karnal Road, Ring Road, Outer Ring Road, Mathura Road, Mehrauli-Badarpur Road. Hence, the traffic police is keeping a special vigil and check on these road between 10 pm and 2 am. It will focus on the fundamentals of the teaching-learning process, managing content, effective classroom delivery and effective assessment and grading. The workshop will be highly participative and the main focus will be on providing ready to use information and techniques. training to engineering faculty. They were generally hired on the basis on their academic qualifications and excellence in research. They are rarely required to undergo any training/orientation on the art and craft of teaching. Taking this major transition from engineering to teaching for granted, they often tend to underestimate the challenges of their new profession. They have little exposure to the art and science of teaching which involves amongst other things, the task of understanding the learning process; managing student expectations and motivation; packaging of the complex information effectively; sustaining interactivity and live classroom communication; designing objective-based assessment andgrading effectively. The participants will be able to identify and master the key psychological and educational concepts regarding the teaching learning process. They are able to plan and deliver a high quality lecture using common instructional tools and techniques. The understanding is for a term of five years. The delegation headed by vice president Bangladesh Engineering Association Abdul Motalib was here on the invitiation of the FIA a few days back . He had visited about half a dozen manufacturing units. Motalib said that industrialists in his country could gain from the raw material and expertise available here. The labour was cheap and power was in abundance .Those interested in business would ,he added. Bangladesh industrialists import spareparts from the US to the tune of $ 350. The industrialists would gain even if they could locally produce 10 per cent of the import. It is in this context that the MoU has been signed with the FIA. FIA president Sunil Gulati said that it was a matter of pride for organisation to have signed the MoU. She had been admitted to the department with complaints of severe headache, vomiting, blurring of vision and unsteady walk. The surgery took almost six hours. The tumor and its origin were removed. “The draining vein of the brain was also removed, said BK Rao, chairman of the hospital.. The tumor ,measuring 16 cm X 10 cm X 8 cm, was extending onto both sides of the brain and infiltrating and obstructing the main drainage channel,” said Dr Rana Patir, one of the doctors involved in the operation. Red Ribbon Express is a unique rural communication campaign on train which was launched on December 1, 2007 on World AIDS Day as Sonia Gandhi flagged off ‘Red Ribbon Express’ from Safdarjung Railway Station, here. Red Ribbon Express (RRE) Project is a national campaign to highlight the issue of HIV/AIDS through a specially designed train travelling to different parts of the country for one year. About 180 major railway stations/halting points will be covered through this campaign traversing over 27000 km at a stretch in a Bharat Parikrama pattern. Each of these 360 days will see multi-level activities. A multi-sectoral project to spread awareness on HIV/AIDS, the campaign aims to promote safe behavioural practices. The vision behind the project is to mainstream HIV/AIDS within the context of overall socio-economic development rather than merely as a medical/public health issue. Originally conceptualized by the Rajiv Gandhi Foundation as a multi-partnership national campaign, its execution is being spearheaded by National AIDS Control Organization (NACO) and the Nehru Yuva Kendra Sangathan (NYKS). In the Nukkar Natak “Bimar Bhi Insan Hai”, the artists presented the facts and different aspects of AIDS. One of the other highlights of this event was the signature campaign where the people and guests got the opportunity to make their presence felt by signing and supporting the Red Ribbon Express campaign and thus giving a different aspect of public participation to the entire effort. On this occasion, Dr Shakeel Ahmed Khan (DG, NYKS) presented the broad objectives of the Red Ribbon Express; i.e. to provide a complete communication, counselling, treatment and care package to the target population, especially in rural areas with special focus on youth and other vulnerable groups, so that they stay away from the ill-effects of this life spoiling illness. For this RRE is a revolutionary movement where we target every individual from any caste, religion or community. Sports minister Mani Shankar Aiyar said in a written reply in the Rajya Sabha on Thursday. “High level meetings are regularly held to assess the preparations for the event,” he said. On the state level, there was a sub-committee under the Chief Minister to take decision in respect of infrastructure and other preparations. To improve the performance of the Indian contingent in the games, extensive discussions were being held with all the stakeholders. 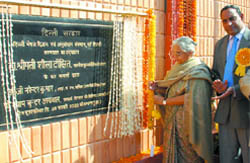 She was inaugurating the Second International Symposium on “Recent Advances in Cardiovascular Sciences 2008” at the Delhi Institute of Pharmaceutical Science & Research (DIPSAR). She also declared open new wings of UG and PG girls’ hostel, a guest house and a swimming pool. Secretary (Technical Education) Dr. G. Narendra Kumar was also present whereas number of experts from different countries participated in the symposium and presented their papers. A poster presentation was also given. Around 25 eminent experts expressed their views on the subject. She said that it was time to develop DIPSAR as a deemed university which would go a long way in turning Delhi into a knowledge hub and knowledge capital of South Asia. Apart from this SAARC University was also being set up in Delhi. Dikshit described Delhi as an excellent medical hub where expertise and reliable treatment is available at cheaper and reasonable rates. In fact, cardiovascular diseases have emerged in economically developing countries during recent decades. During this period, illness from infectious diseases has diminished, but changes in lifestyle and diet have led to an increase in life expectancy and a greatly increased frequency of cardiovascular disease and other chronic diseases. Under these circumstances it becomes important that the scientific community gets together to discuss the existing therapies and undertake research to develop newer and more beneficial therapeutic options. The award was received by director of NHPC, SK Chaturvedi at the 10th international conference, INBUSH (International Business Horizon 2008) at Amity International Business School. The honour acknowledges NHPC’s endeavour at initiating the best practices of corporate social responsibility for people affected during the construction of NHPC power stations. The NHPC was selected for the award from among Indian and international companies from across 20 sectors. According to the DMRC, the direction of traffic on this road will be from Shahjahan Road to Subrahmanium Bharti Marg. Light vehicles which want to go towards India Gate or Shahjahan Road from Subrahmanium Bharti Marg may use the Pandara Road while heavy vehicles can use the Zakir Hussain Marg.